You know I am a planner fanatic. When Michael Hyatt announced his new Full Focus Planner, I had to be one of the first ones on board. I signed up for a yearly subscription and have been very pleased with my results thus far. https://almostpractical.com/wp-content/uploads/2017/09/full-focus-planner-review-michael-hyatt-001-1200×628.jpg” alt=”Full Focus Planner Review – Michael Hyatt” width=”1200″ height=”628″ /> Michael Hyatt's new Full Focus Planner. So, of course, I had to write a review and tell you all about it. I have tried all manner of planners and had not yet found one that I loved. For me, the purpose of a paper planner goes beyond keeping track of my appointments because I use my electronic calendar for that. My paper planner is where I block out exactly how I am going to use my time each and every day. This means that I need to have space for a to do list – again for the day, and also a place to jot down notes as they come up. I know what you are thinking – just about any planner with a 2 page per day layout can accomplish this. When http://almostpractical.com/go/fullfocusplanner” target=”_blank” rel=”nofollow noopener”>the Full Focus Planner first landed on my radar a few unique things jumped out at me immediately. This planner incorporates goal setting into your daily routine, which many planners do not. https://almostpractical.com/wp-content/uploads/2017/09/full-focus-planner-michael-hyatt-goal-setting-pages-1200×628.jpg” alt=”Full Focus Planner by Michael Hyatt – Goal Setting Pages” width=”1200″ height=”628″ /> These are some of the goal setting pages in the Full Focus Planner. In the Full Focus Planner, you set your yearly goals and break them all the way down into weekly goals and then daily goals. Your daily goals serve to accomplish your weekly goals which serve to accomplish your yearly goals. It's genius in it's simplicity, really. The flow is what keeps me on track. By having all my goals in one place, I can constantly review the big picture. Honestly, I have a tendency to go off on tangents. One thing will lead to another, to another, to another – and so on and so forth. Before I know it, the day is gone and I didn't get my stuff done. With the http://almostpractical.com/go/fullfocusplanner” target=”_blank” rel=”nofollow noopener”>Full Focus Planner, whenever I find myself at a loss for what to do next, or with a few extra minutes to fill – I look at my goals and strategically decide what to do to fill the time. Because of the goals feature, I even force myself to do tasks that I don't want to do. I still procrastinate (sheepish grin) but not as much. Each Full Focus Planner includes 3 months of undated planning pages. So, each quarter you get a new book. The planner itself is covered in black linen and bound into an actual book. The cream colored pages within begin with your goal summary and details, move into your monthly calendars, and then provide space for repetitive things that you do daily. You then move on to your daily pages which are a two page per day layout. At weekly intervals you review your week and plan your weekends. Naturally, at the end of the quarter you assess where you are with your goals and set up your new book accordingly. I love the structure that it adds to my life. When I first saw the http://almostpractical.com/go/fullfocusplanner” target=”_blank” rel=”nofollow noopener”>Full Focus Planner, I was a bit skeptical about whether it would truly appeal to me. You see, I am a very visual person. I like my planners to be colorful, inspiring, and well – pretty. In contrast, the Full Focus Planner is rather subdued. I would almost venture to say “boring” looking (ouch!) especially when compared to the very fun looking https://almostpractical.com/erin-condren-lifeplanner-review/” target=”_blank” rel=”false noopener”>Erin Condren Life Planner. It definitely looks right at home in a boardroom. But once I actually started using the Full Focus Planner, I was pleasantly surprised. The black and white backdrop is perfect and allows me a lot of flexibility for my creativity without adding any distraction. I love using colored pens, stickers, washi tape, and other embellishments to dress up my planners (http://amzn.to/2k3griv” target=”_blank” rel=”nofollow noopener”>especially these planner stickers from Create 365). Those pops of color help me remember what I need to do and also to find things in the planner quickly. If you are not familiar with Michael Hyatt, he is known for being more or less the king of productivity. His http://almostpractical.com/go/free-to-focus” target=”_blank” rel=”nofollow noopener”>Free to Focus productivity course is extremely popular and has helped many people squash the overwhelm. Because of this, I knew that the Full Focus Planner would be good. But what I didn't realize is that there are also https://fullfocusplanner.com/tutorials/” target=”_blank” rel=”nofollow noopener”>a series of “how to” videos that explain how to use the planner for maximum productivity. Even though planners may seem self explanatory – I watched every video and they definitely helped me formulate a method for how I wanted to use the planner. 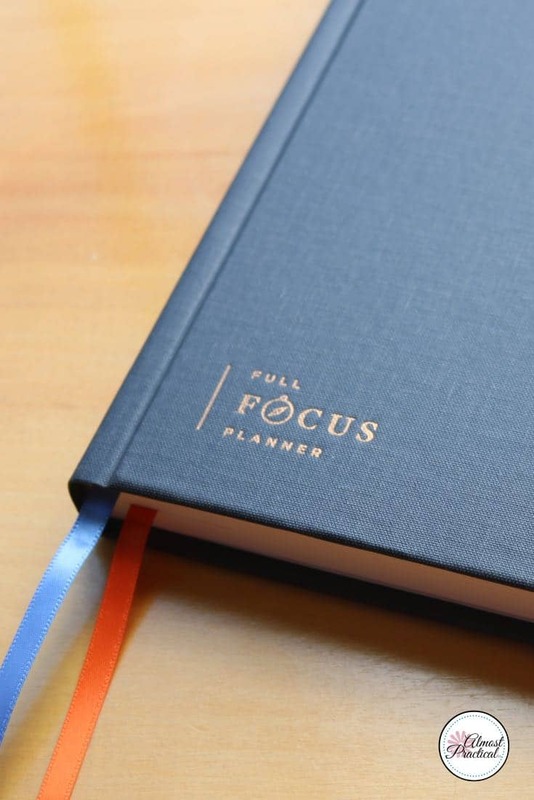 If the Full Focus planner has sparked your interest http://almostpractical.com/go/fullfocusplanner” target=”_blank” rel=”nofollow noopener”>click here to get a coupon that you can use for 15% off of your order. The goal setting approach to planning has definitely helped me stay on track and do more of what adds meaning to my life. Oh, and did I mention that the packaging is pretty awesome, too? https://almostpractical.com/wp-content/uploads/2017/09/full-focus-planner-michael-hyatt-packaging-1200×628.jpg” alt=”Full Focus Planner by Michael Hyatt | Packaging and Unboxing” width=”1200″ height=”628″ /> The Full Focus Planner is professionally packaged and a joy to open. That’s what I call a serious planner! I love that you can buy one to cover a quarter of the year before deciding whether to subscribe. It is a solid planner – but only as good as its owner is diligent. 😉 The quarterly option is nice because I tend to be fickle about planners – usually about halfway through the year I get the itch to try something new. I’m going on my second quarter with this one, though and so far I like it. I did read that the format of the new quarter will be slightly different – so I am waiting to see how I like the changes. Thanks for this helpful review – and the discount coupon! I’ve just ordered the planner to try it out, am hoping it will work for me. Yes, it takes a while to get used to (I watched all the tutorials as well) and I’m still tweaking how to maximise the weekend pages, but it’s great and SO helpful. Thanks again for the great review. That is great news – I am glad you like it! Thanks for the review. I’m just on the verge of ordering my planner, but I have a couple of questions about it before I do. 1. Does it include a monthly calendar layout? I didn’t see one in the sample layouts on the website. This would be a deal breaker for me. 2. Is the weekend optimizer integrated into each week or is a just a template within the planner? As much as I would love to be able to relax and recharge EVERY weekend, it isn’t reality and I would still need the weekday layout for many weekends. It is probably best if you direct your questions to customer service at the Full Focus Planner. I say this because, the planner has changed since it was first introduced – in response to customer feedback (which is something that I really like). The first version did have monthly pages, and the second had more of a perpetual year layout (hard to describe). There has been much discussion in the FB group about this and I have no idea if they plan to make any future adjustments. If I understand your second question correctly, then – there are actual pages for Saturday and Sunday that are exactly the same as the Mon thru Fri pages. In addition there is a 2 page weekend optimizer spread for each weekend that lets you plan out your weekends as well. I recently purchased the Full Focus Planner to test drive it (based of if this and a few other reviews — thanks!). I love analog planners and have been using my franklin planner for years. This planner has everything that I love about the Franklin and more. I highly recommend it. I also really like the Full Focus Planner. It keeps me accountable to myself and helps me to figure out exactly what to focus on each day. Even though I also use digital to keep track of appointments – analog (love that term!) is the way to go for planning and for jotting notes and ideas. Thanks for stopping in and taking the time to comment! Does it matter when you start? I just bought the subscription (thanks for the discount code) and I don’t want to waste a full 2 months if it has dates for each page. It does not matter when you start because the planner is not prefilled with dates. However, I like to start at the beginning of a quarter – so April would be a perfect time. Each planner has 3 months worth of pages. Ugh! It seems that the coupon is no longer working. Thank you for letting me know. I will remove it from the post and keep my eyes peeled for a new one.